Just inside Everglades National Park is a unique side of Miami unbeknownst to many travelers in Florida. Visit Miccosukee Indian Village, about 40 miles west of Miami proper (a 30 to 40-minute detour that’s 100 percent worth it! ), for a history lesson unlike any other and an adventure-filled day. At Miccosukee Indian Village, you can learn about Miccosukee Indian Tribe culture seven days a week. Step into the Miccosukee Museum where you’ll find historical artifacts, paintings and more or take an airboat ride on a balmy, breezy day. Try your luck at the casino (you may win!) and, of course, don’t even think about heading home until you’ve grabbed a bite at one of the Village’s dining establishments. Read on for a little history on Miccosukee Indian Village as well as a breakdown of where the reservations are located, what you’ll find at each reservation and things to do once you’re there. A day trip is perfectly adequate, but it's possible to spend an entire weekend here, too, as long as you book a room in advance since there's not much nearby. Originally part of the Creek Nation, the Miccosukee Tribe migrated Southeast from the Oklahoma area before Christopher Columbus and before Florida became a part of the United States. In 1962, the Tribe was recognized by the U.S. government and the U.S. Secretary of the Interior approved the Miccosukee Constitution, granting the Tribe legal rights within the U.S. government to a sovereign, domestic dependent nation. What does all this mean? It means that Miccosukee Village has its own law enforcement and its own way of doing things, separate from the U.S. government. The Miccosukee Tribe of Indians of Florida take pride in their home and welcome visitors to their Village with open arms in order to share a piece of their culture with the outside world. Take advantage and plan a day trip to the Village, but remember to always treat it with respect and kindness, just as you would your own town. There are actually four distinct Miccosukee Tribe of Indian reservation areas. There are two at the intersection of Krome Avenue and Tamiami Trail. At the first, you’ll find the 56,000 square-foot, state-of-the-art Miccosukee Indian Gaming Facility, and the Miccosukee Resort & Gaming. The second is home to the Miccosukee Tobacco Shop. Then there is the Alligator Alley reservation, north of Miami and west of Fort Lauderdale. It’s the largest of the Tribe’s reservations and includes 75,000 acres of land — 20,000 with potential for development as well as 55,000 of wetlands. The Tamiami Trail Reservation Area, closest to actual Miami, is where most Tribal operations take place and where most of the Miccosukee Indian population resides. There, you’ll find a police department, clinic, court system, day care center and more as well as the restaurant, general store, Indian Village and museum. Book a room at the resort, which is more than enough to keep you entertained for 24+ hours with three bars/lounges, pool and fitness center, spa and salon and even a kid-friendly arcade. All 302 guest rooms scream luxury with eco-friendly amenities; some suites even offer split living areas, executive wet bars, and whirlpools. Tour the Everglades like never before on an airboat. Airboat rides are meant to accommodate quite a few passengers so no need to leave mom or the kids at home. Spot wildlife, including gators, birds and native plants while passing through the “River of Grass.” You’ll also have the opportunity to stop on at a Miccosukee hammock-style Indian Camp that’s been around for over a century. Fun for the whole family, for sure. Then there are alligator wrestling shows. If you’re looking for an Instagram photo opp, this is it! Get your camera ready and witness tribesmen perform Miccosukee Indian rituals in a pit full of gators. If you’re lucky, he might even stick his hand and/or his head in an alligator’s mouth and end the event unscathed. Six demonstrations take place daily, between 11 a.m. and 4 p.m.
With five eateries on site, you’ll never go hungry. Options include the Friday seafood buffet, a 24-hour deli, fine dining, a snack bar and more. Expect local cuisine with an international twist that includes juicy steaks, a superb wine list, decadent desserts and more. And then there are seasonal celebrations. 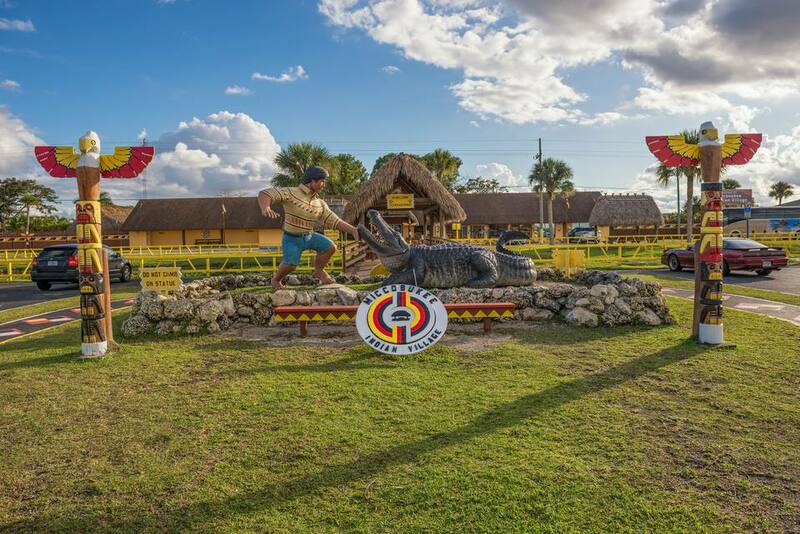 The last week of December, Florida’s Miccosukee Tribe of Indians hosts an annual Indian Arts & Crafts Festival celebrating the culture through music, dance, art, authentic food, and alligator demonstrations.